I don’t care how much you think director Martin McDonagh is working you over with “Seven Psychopaths”, his first movie since 2008’s “In Bruges” (terrific movie by the way). And I don’t care how many annoying film critics complain that McDonagh doesn’t yet know his way around a camera. “Seven Psychopaths” is literate, lively cinema. A bit of craziness in a sea of bizarro fun. Not yet convinced? Then let me ask you this: Would you miss out the chance to see Colin Farrell, Christopher Walken, Sam Rockwell and Woody Harrelson in a movie as weird as “Seven Psychopaths”? I know I wouldn’t. The setup is simple: Walken is a con artist named Hans. His specialty? Kidnapping dogs and holding them for ransom with his pal Billy (Rockwell). Things go Kaboom when they end up kidnapping Bonny, a Shih Tzu belonging to Harrelson’s Charlie Costello, a gangster with doggy issues (told you the movie was crazy). Meanwhile, we meet Farrell, an alcoholic Irish screenwriter blocked on his new script. He hasn’t written anything but the title, Seven Psychopaths. To help, Billy puts out an all-points alert for psychos of the earth. That means Harrelson (among others) could make the list. The actors do wonders with their roles. Farrell, following a disappointing turn in “Total Recall” gives a performance of ferocity and feeling. He’s got his mojo back. And Walken is a pleasure to watch, his face a road map to his character’s soul. The climax is admittedly bugfuck, much like “In Bruges”. 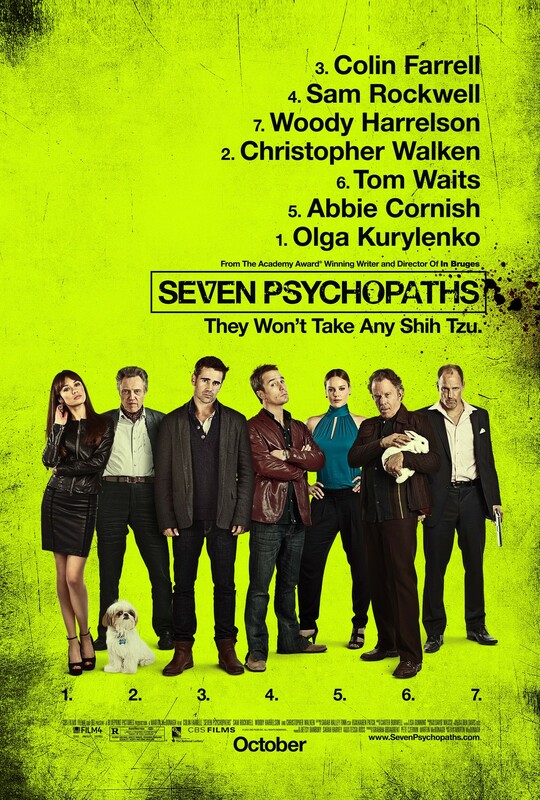 But “Seven Psychopaths” is a hilarious and hypnotic movie, just the thing to get lost in.